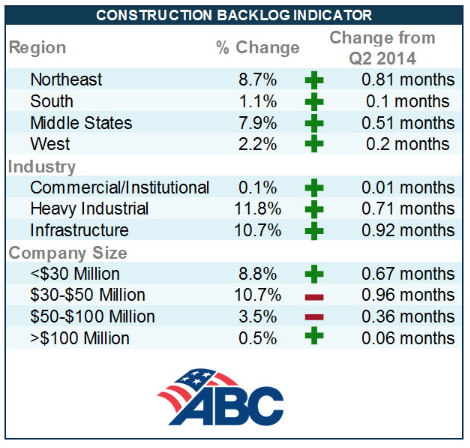 Associated Builders and Contractors (ABC) Construction Backlog Indicator (CBI) reached a new all-time high during the third quarter of 2014 at 8.8 months, eclipsing the previous all-time high of 8.5 months in the second quarter of 2014. The 2014 third quarter backlog is 6.9 percent higher than the third quarter of 2013 and the continued growth of backlog during the last six months likely indicates that 2015 will be a strong year of recovery for the nation’s nonresidential construction industry. 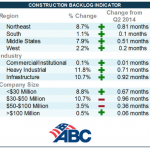 “Every region of the nation experienced expanding backlog during the third quarter and so did every industry segment,” said ABC Chief Economist Anirban Basu. “Recent data regarding nonresidential construction and employment has shown only sporadic gains, which is consistent with the less optimistic backlog readings registered earlier this year. But the last two quarters tell a positive story that the average nonresidential contractor in America is positioned to get busier. Average backlog increased in all regions, including in the Northeast. The technology boom in Boston’s suburbs, the positive impacts of Marcellus Shale-derived activities and a resurgent Wall Street are all contributing. A recent uptick in subcontractor failure may also be contributing to rising backlog among industry survivors. Backlog remains lowest in the Middle States, in part because of still-sluggish conditions in Illinois. However, conditions continue to improve in Ohio and Michigan. Average backlog is up by nearly two full months in the Northeast over the past year and by more than two months in the West. This is consistent with a rapid rebound in many East and West Coast communities that previously were held back by the housing and financial crisis of several years ago. Average backlog is at or nearly at a record high in three regions, the Northeast, Middle States, and the West. Backlog in the South has not progressed over the past year, but is positioned to expand due to the recent acceleration of economic growth in Louisiana, Georgia, Florida, Texas, and a number of other states. For media inquiries, contact Jeff Leieritz at leieritz@abc.org. To sign up to participate in the survey, email backlogsurvey@abc.org. To receive CBI as it’s release, subscribe here.